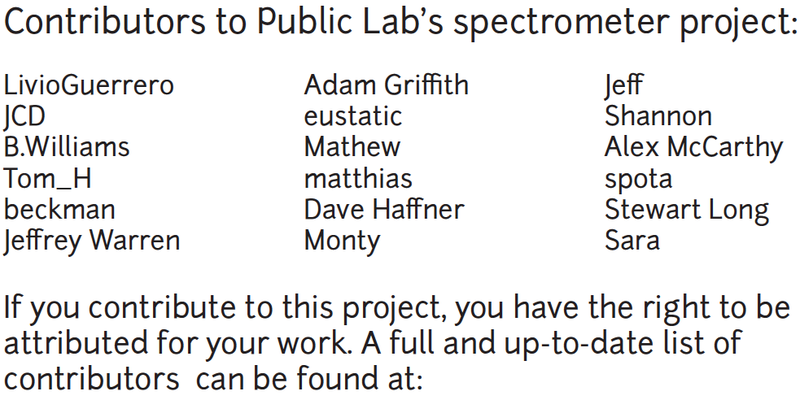 mathew was awarded the Basic Barnstar by liz for their work in this research note. photo credit @Stevie, Washington University students build camera rigs. 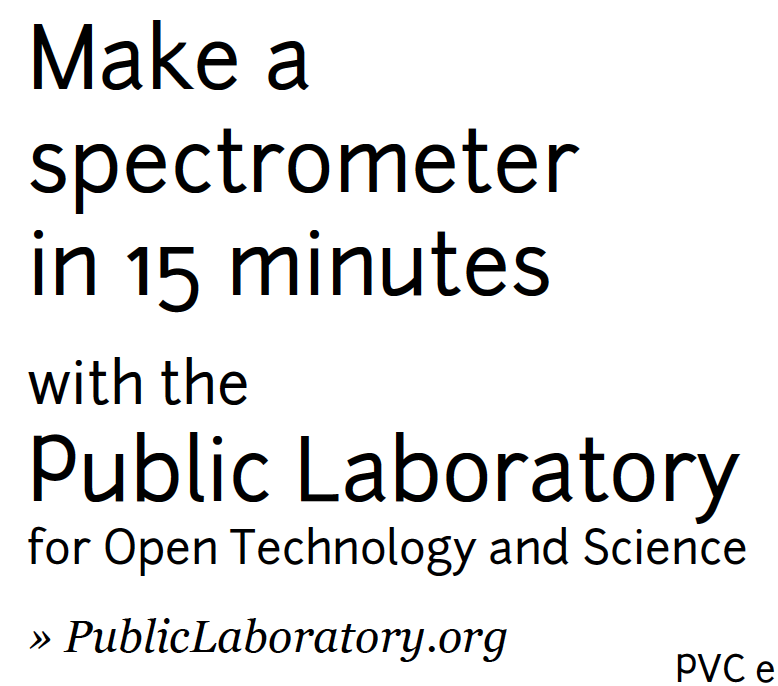 Giving proper credit for Public Lab's collaborative hardware development is a challenge. For open source software this challenge has been mastered by version control systems and code annotations. Its pretty clear who wrote what in a software package. Some open hardware is easily trackable like software because each component is a digital file that can be tracked using software-derived systems, and the collaboration centers around digital repositories. 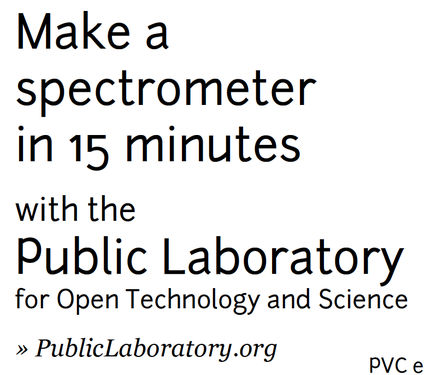 Public Lab tracks our kits production through Github, but our development is a a mixture of practices where documentation difficult. Our hardware development cycle includes word-of-mouth skill building between practitioners, in-person workshops, private blogs, private and public e-mail lists, research notes and wiki edits, and Github contributions. 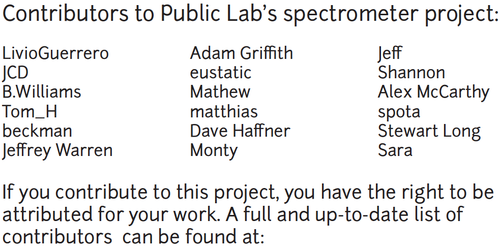 Full credit would include who participated in the designs, what they did, and the size of the contribution. Over time we've tried a mixture of qualitative and quantitative strategies for attribution that have been both very specific in places and deliberately vague. As we continue to explore new strategies, the only thing we're settled on is that somewhere there should be a list of every contributor's name. 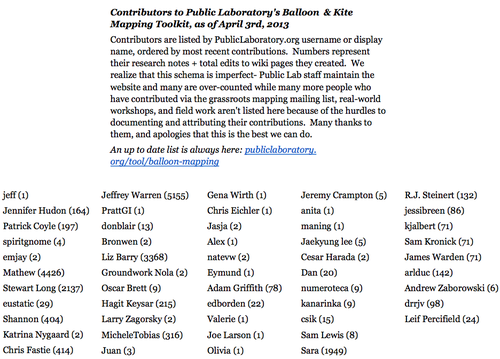 At first, we only had an e-mail list (Grassroots Mapping) and volunteers. 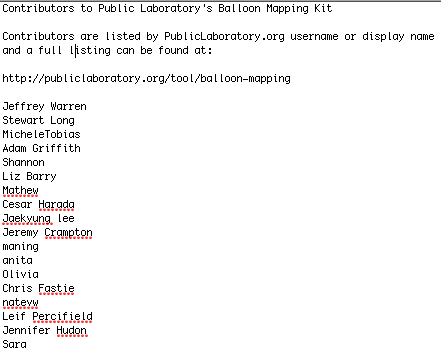 For a period of 2010 Jeff @Warren was working on balloon mapping full time in completion of his graduate thesis, and was able to put together a first edition balloon mapping guide that he signed. After a full revision the 2.2 guide included so many contributions from the community, Jeff took his name off, even though it is almost entirely his illustration and layout. We've left instructions unsigned since then. As a staff we ask, when one is recording the ideas of others, where does authorship lie? 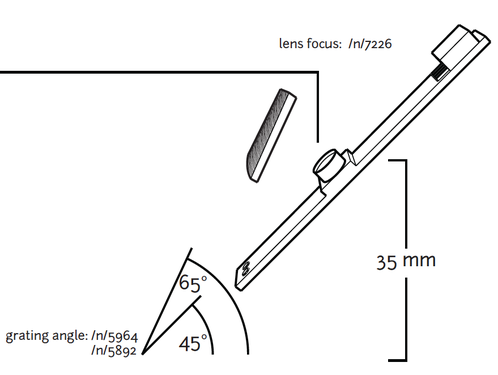 As we developed kits, authorship seemed more urgent-- I was running a kickstarter, but the kit parts were just a list of best practices I put together. 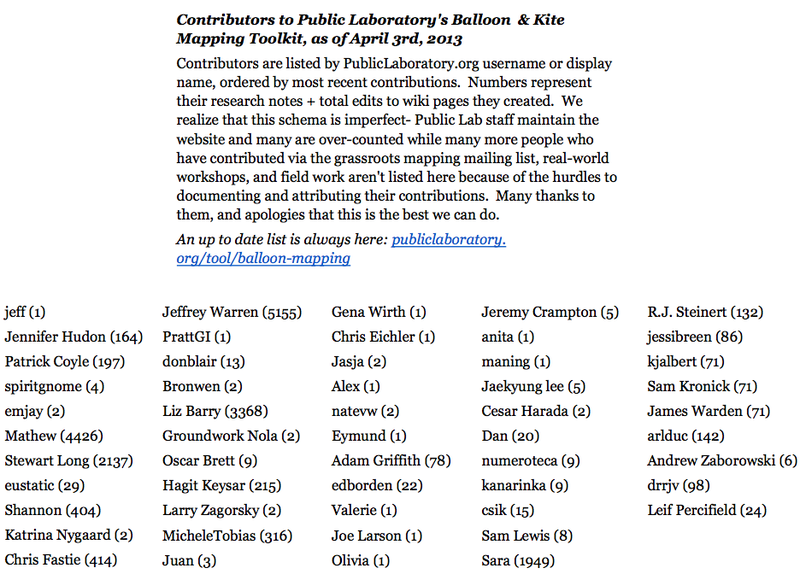 This list is of usernames contributing to the grassrootsmapping blog or public lab site. I put the original gulf mapping team and volunteer group up top because I think they did the most work on the parts in this first kit. This made sense at the time but we wanted a less subjective and arbitrary process. 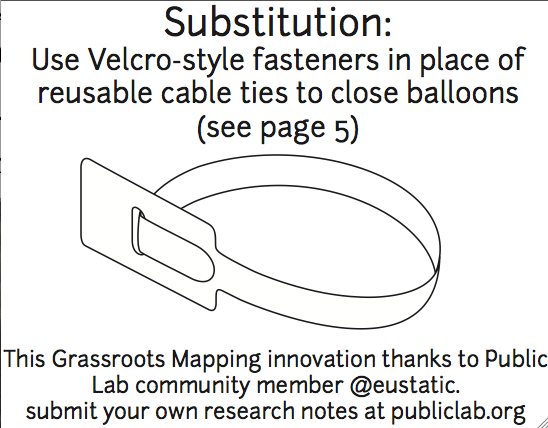 Since our first balloon kit we've gone through an average of three revisions of each kit part. In that time we've also used two quantitative strategies for attribution. First we tried quantifying total wiki edits and research notes. That produced extremely skewed numbers. For instance, Cesar Harada is a significant technical contributor, and Hagit Keysar one of our most prolific mappers, but I help maintain the wiki pages and am therefore credited with one hundred times Hagit's contribution and two thousand times Cesars. We used to have these numbers online but stopped, in favor of our second strategy. 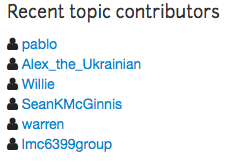 Our second attribution strategy was less specific and we've stuck with it-- we list people by most recent contribution. The reason we like this strategy is that it points to people working on the tool right now, giving those reading the list a place to start contributing. 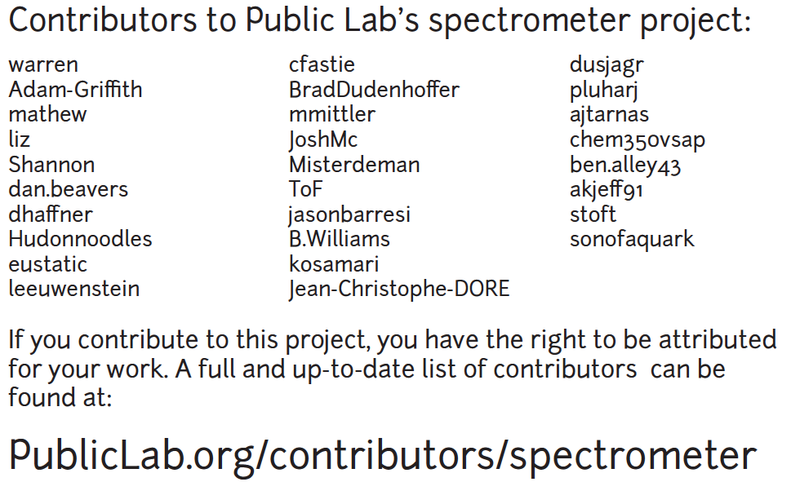 It also suggests something about credit on an active open hardware project--the most important function of attributions is to help tool users become tool contributors by helping them find current contributors. 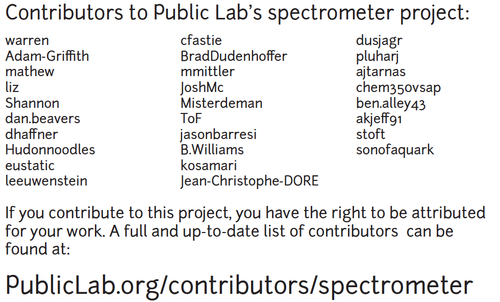 The spectrometry project started out with the 'authorless' strategy, and moved quickly to a list by most recent contribution, which is how we've credited people in the instructions for the past three years. Starting in January 2015 we've added a new strategy to the spectrometry kit 3.0-- we're putting shortened web links to research notes and wiki pages directly on the tool itself. This leads potential contributors straight to the research and researchers working on a specific component. Combined with new design strategies centering around paper substantial contributions have come more quickly and been easier to integrate) back into the kit than with our previous spectrometer design. Printing directly on the kit itself works well for paper kits, but for kits that are an assemblage of manufactured parts like the balloon kit, we'll use fliers to call out recent contributions. Authorship is a window into development process that should invite new contributors in and show them where they can help. Assigning credit is an historical project with narrative elements that will always be qualitative. We have moved away from trying to quantify "absolute" credit, some percentage of authorship, focusing instead on an instrumental definition: authorship should be an invitation. Authorship should provide new contributors with a map of current development and developers, so they can find a place to work and people to work with. If there are other ways to improve that you think of, let's keep refining! Interesting to see the evolution. I need to check out Scott's velcro fastener tip.